1975 - Looking Back At MONTY PYTHON AND THE HOLY GRAIL | Warped Factor - Words in the Key of Geek. You could be forgiven for thinking that you'd popped the wrong DVD in the machine as the opening to Monty Python and the Holy Grail is... well... odd! But then this is Monty Python and the rulebook does not apply to them. Once the voice of the coarse British man is audible you realise that the Python's have duped you again with their anarchic surrealist sense of humour. 90 minutes later and the movie ends in an equally odd fashion, fortunately just about every minute in-between is utterly hysterical, infinitely watchable, equally quotable, and when combined possibly give us the funniest movie ever made. 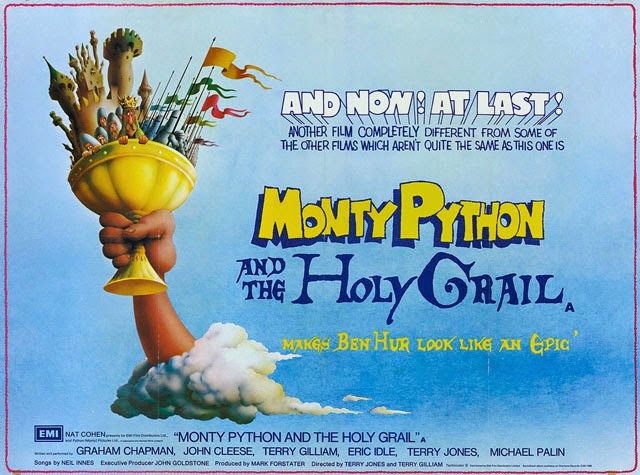 Even now, 40 years on, Holy Grail is head and shoulders above any so-called comedy film Hollywood has to offer. Filmed on location in the British countryside with a meager budget (the kind the Pythons were used to from their years at the BBC), I suspect that nobody working on the movie quite realised just how big it would become, propelling the ensemble cast to global fame. Having worked together for the best part of the previous 6 years; Graham Chapman, John Cleese, Terry Gilliam, Eric Idle, Terry Jones and Michael Palin were old pros at their game, effortlessly bringing their brand of humour to the big screen for the first time - discounting 1971s And Now For Something Completely Different, as that was essentially a collection of their famous sketches re-shot on film for American audiences. In Monty Python and the Holy Grail, King Arthur and his Knights of the Round Table are sent on a most glorious quest by God. The big guy upstairs has tasked them with seeking the Holy Grail, the legendary cup that Christ drank from during The Last Supper, prior to his execution, and which later caught Jesus' blood as he was left danging upon the cross. 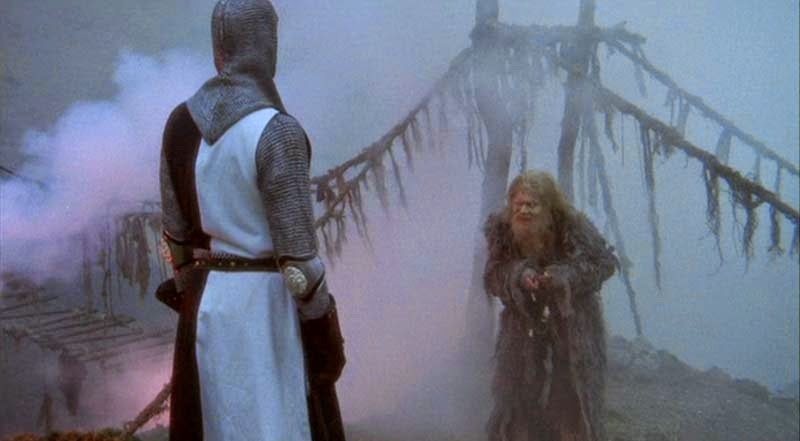 Heavy stuff you may think, but in true Python fashion all the seriousness surrounding the Holy Grail is left wholly untouched and instead we follow King Arthur and his men as they come upon an odd assortment of characters, including The Black Knight, Dennis, The Bridgekeeper, The Knights Who Say "Ni! ", and The Killer Rabbit, all of whom hinder the daring soldiers in their quest. Of course, if you do not enjoy the particular brand of Python humour then Holy Grail will likely leave you cold, and I understand that as when I was much younger I never used to get them, I'm sure a lot of it was likely down to a feeling of them being dated and before my time - the impatience of youth. I caught Holy Grail in an early TV showing, and again it just didn't click for me. It looked like it was all made up on the spot, and I found that the exact same jokes were playing out again and again with many of them feeling overly stretched out. Take the coconuts for example, amusing and silly when introduced, but felt somewhat repetitive and unnecessary after an hour. But as I grew up I came to appreciate Python in a new light - I don't know when it happened, it just happened, a realisation that Python is actually rather ingenious comedy. Those drawn out jokes were most likely cleverly crafted and timed to suit a purpose. For example, the fact that the men do not ride on horses is another initially amusing and silly concept, and quite a major idea the first time it's revealed. It becomes the central subject of a conversation between Arthur and the man atop the castle battlements, but later on the notion of no horses is played smaller and in the background as so we can concentrate on the current jokes at hand, as well as the missing horses as an added bonus. 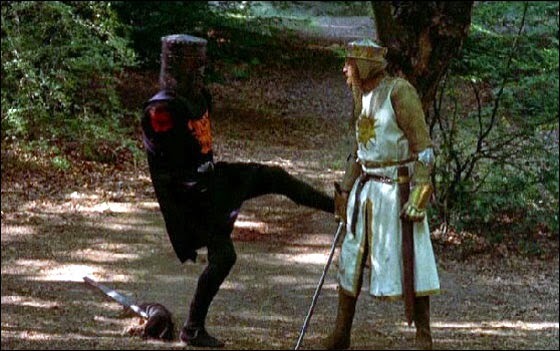 There are countless classic scenes, including the battle between The Black Knight and King Arthur ("I've had worse! "); the scene where Sir Lancelot the Brave (or Launcelot, as the script for the film names him) storms the Swamp Castle in hopes of rescuing a fair maiden and, in result, ends up destroying everything in his path (including the candle mounted along the wall leading to the spiralling staircase), saying that he gets a bit frantic and over-excited in this genre; Sir Robin and the Three-Headed Knight ("...when danger reared its ugly head he bravely turned his tail and fled..."); The Knights Who Say "Ni!" and their request for a shrubbery; the Killer Rabbit's attack on Arthur's merry men. I really could go on. You can do worse than see it. 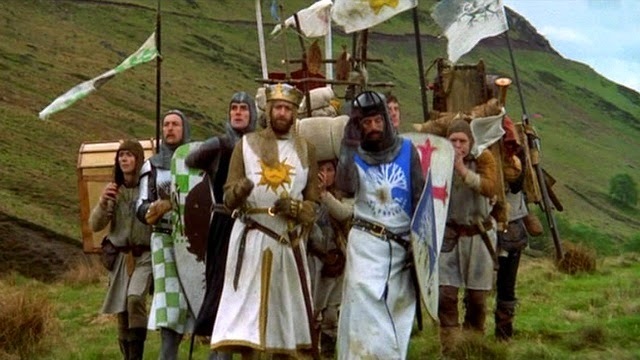 Monty Python and the Holy Grail may just be the funniest film ever made, but even if one day it loses that award to another comedy it will likely forever be the silliest film ever put on celluloid. It rarely makes sense, it's full of ridiculous characters in ridiculous situations, and can't fail to put a smile on your face. It's true what they say, you can do worse than see it!